The icons called Korsun are named after an original icon that is said to have been brought by Prince Vladimir, the enlightener of the Russian Lands to Orthodox Christianity, from Korsun or Cherson, a Byzantine holding at the Crimea on the Black Sea. Prince Vladimir turned from paganism to Christianity and married a Byzantine Princess, Anna, in Cherson at the time of his conversion. It is believed that the original icon called Korsun was given him as a gift from the Byzantine Emperor Basil II (a.d. 976-1025). Tradition ascribes the original icon to the hand of the Holy Apostle Luke the Evangelist. 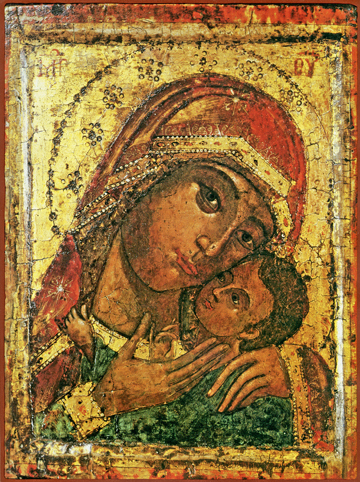 Important copies of this icon were made and kept in the cities of Poltava and Kharkov, and thereafter many copies were made and distributed in Russia and the Ukraine, making this a well-known icon. This particular copy was made around 1750 and is modeled after the original. Here the Virgin Mary holds her Son in a loving embrace and has her right hand raised to point us to her God and Saviour Jesus Christ. She looks at us and through and beyond us, too, for her message for all is to look at Christ. The Lord looks inward and to His mother in love.